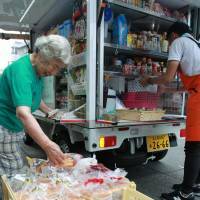 Mobile supermarkets are beginning to pop up in urban areas, including Nagoya. Originally, most of the trucks were designed to service underpopulated areas where there are few shops. However with the growing number of aging baby boomers with limited access to shopping facilities or who have difficulties carrying heavy groceries, companies are now beginning to serve a segment of that elderly population in urban areas. A small truck drives up to a house in Minami Ward, Nagoya, where 85-year-old housewife, Kazu Todo, lives. The vehicle is packed to the brim with about 700 items, including side dishes, daily necessities and perishables such as meat and sashimi — just like a store but on wheels. Although there is a supermarket located 700 meters away from Todo’s house, she has difficulty walking because of weak knees. “Previously I would jot down a grocery list, give it to my husband, and ask him to go shopping,” Todo said, as she buys fruits and vegetables. 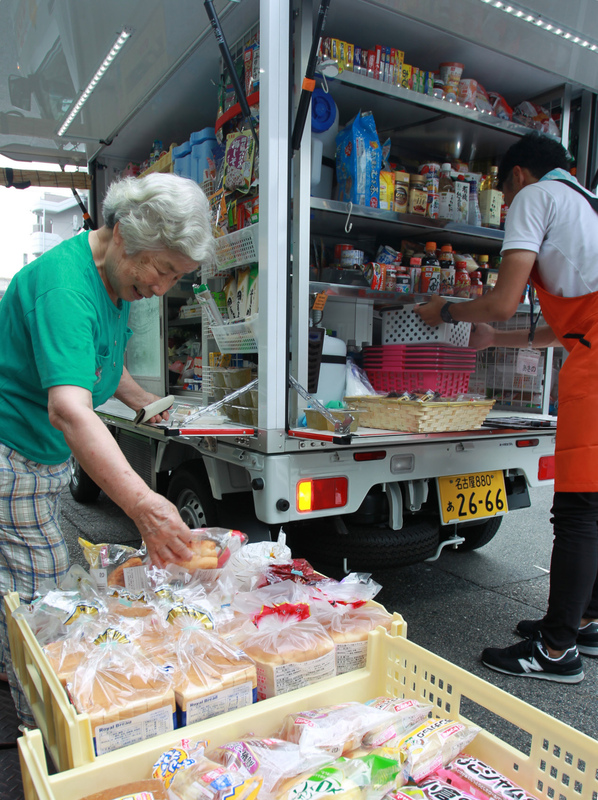 Kosugi Co., a supermarket chain operator based in Nagoya, began running the mobile supermarket truck called Tokushimaru on July 28. Kosugi learned how to modify trucks from Tokushimaru Inc., a Tokushima-based company that operates a nationwide chain of mobile supermarkets covering 42 prefectures. “We received more calls than we expected to come to their homes. That made me realize that there are many people who need this service,” said Kenichi Kosugi, president of the Nagoya company. People at age 65 or older make up 29 percent of Minami Ward’s population, which is 5 percentage points higher than the average for Nagoya and is the largest proportion of the elderly in the city. Kosugi adds a ¥10 surcharge per item in the mobile supermarket. Even so, it has received orders from approximately 80 households, so it plans to stop at each house twice a week. Kosugi also plans to run another truck in Chikusa Ward by the end of the year, as well as in Nakamura Ward eventually. Since the sales drivers visit the customers’ homes to sell goods face-to-face on a regular basis, they can easily spot if something is amiss with the customers, such as if they don’t appear to be collecting their mail. Therefore, the Nagoya city office accredited Kosugi as a business that helps monitor elderly people. The sales driver also tries to help the aging customers in housekeeping such as changing light bulbs. Lawson Inc., a major convenience store chain, has provided a similar mobile store service in underpopulated areas since 2013. The company said it will add more trucks to urban areas as well. Katsuya Takahashi, a senior research fellow from the Policy Research Institute under the Ministry of Agriculture, Forestry and Fisheries who is familiar with the issue, believes demand for mobile supermarkets will grow going forward. “The aging baby boomer population who live in urban areas will grow, so there will be significantly more people in those areas who need help with groceries compared with rural areas in the future,” Takahashi said. This section, appearing Tuesdays, features topics and issues from the Chubu region covered by the Chunichi Shimbun. The original article was published on Aug. 1.